Many business owners get stuck when they performing keyword research for their paid search marketing campaign. Many will use Google’s Keyword Planner tool, but most of the times that isn’t enough. If you want to take your keyword research to a higher level take a look at these very simple tips to improve your research. There is a good chance that you can quickly name off a half dozen websites that appear to control the paid search space in your market. You might notice that they are always occupying the prime real estate. They either have an unlimited advertising budget, or they are running a very smart, and well executed PPC campaign. 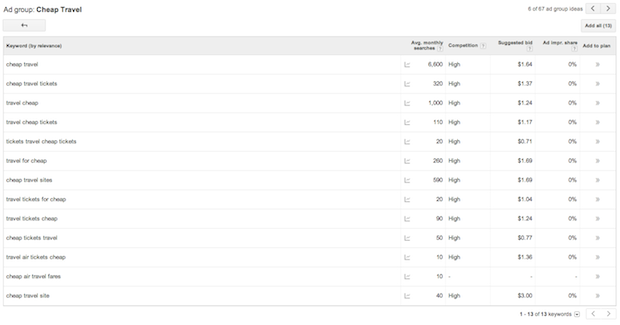 Google’s Keyword Planner will display a list of keywords that are leading visitors to a particular URL. All you have to do is copy and paste the URL into the ‘Your landing page’ section and then click on ‘Get Ideas’ and it will display the data. You can then look at keyword ideas as well as ad group ideas, which is a great option for uncovering new topics that you might have overlooked or not thought about targeting. Once you find an ad group that looks promising you will want to look and dig deeper to look into the keywords included in the group. Now, before you just start adding keywords into your campaign take a minute to see who/what is ranking on top for the particular keywords that interest you. There is a chance that they have an offer running that simply can’t be beat and that ad spend would be wasted. In this example we are looking at the keywords triggering Travelocity.com, so let’s look at the key word “cheap travel” in this ad group. There are some big names occupying the top paid search positions, so if you are running a PPC campaign for a small travel agency that can’t compete with the discount websites this might not be a smart keyword to target. There are going to be some keywords that need to be eliminated and never thought of again simply because there is so much competition that they will not be cost-effective. The highest search volume keywords aren’t necessarily the most profitable. They are definitely the most costly though! Focus on finding keywords with some search volume and lower commercial value. Many people simply look at the data that the Keyword Planner provides on the screen and go by the competition levels “low,” “medium,” and “high.” Did you know you can get more detailed information on the competition? This one is so simple, yet so many people still ignore it so we figured we would mention it again. When you begin to type in a search query into the Google search bar it will provide you with suggestions. Here is an example. So, continuing with our “cheap travel” theme when we type that into the Google search bar it provides some suggestions. The “cheap travel trailers” and “cheap travel sites” aren’t great, but the “cheap travel deals” and “cheap travel destinations” suggestions would be worth looking into in this situation. You can then take the good suggestions and search using them. 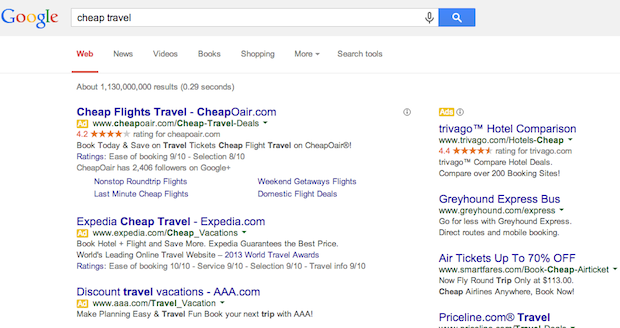 For example, if we type in “travel deals” into the search bar we will get more Google Suggest options. This is a good way to come up with really targeted ad group ideas. These tips don’t require any special software or top-secret methods to uncover great keywords. By using common sense and logic along with some readily available resources you can begin to fine-tune your PPC campaign and find some excellent keywords to target.